A look at medical device recalls over the past three years shows that the number of recalls per year is steady. However, there was a spike in device-related recalls reported in February. FDA has reported a total of 10 medical device recalls so far this year, of which seven were reported in February. Seven recalls in a single month is a lot, but not unheard of. 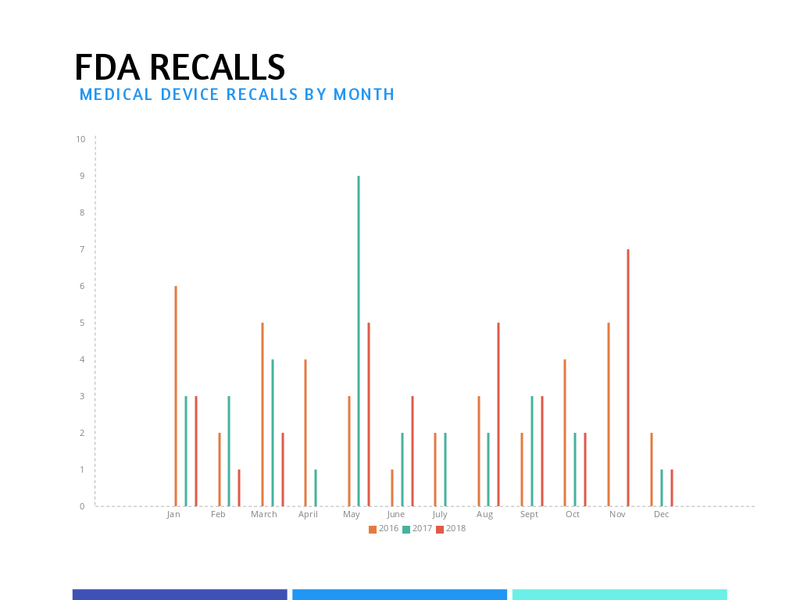 Last year there were a total of 32 medical device recalls, according to FDA's database, with seven recalls reported during November. There were also 32 medical device recalls reported in 2017, nine of which were reported during May. In 2016, there were a total of 39 medical device recalls, with six recalls reported during January that year. See the chart below for a complete month-by-month breakdown of recalls in the medical device sector from 2016 through 2018. As for this year, the most recent device-related recall comes from RVO 2.0 (doing business as Optics Medical), which is recalling the Raindrop Near Vision Inlay because data from the post-approval study showed an increased risk of corneal haze (a type of cloudiness in the cornea due to inflammation) associated with the device. FDA issued a safety communication about the problem in October 2018. The Raindrop Near Vision Inlay is a transparent, curved hydrogel disc smaller than the eye of a needle. The device was designed to be surgically implanted into the cornea of one eye to improve near vision and offer an alternative to eyeglasses or contact lenses in healthy patients. The Raindrop Inlay is designed to reshape the central region of the cornea to provide a zone of increased power for focusing on near objects, resulting in an improvement in near vision. FDA recently said it is taking new steps to strengthen and modernize the process for issuing a public warning about a voluntary recall and for notification of recalls. "Most companies collaborate with the FDA to rapidly initiate voluntary recalls and work with their supply chain partners to remove the product from shelves to prevent further distribution," the agency noted. "And in general, a recall occurs quickly when the problem is discovered. However, there are situations where the FDA may need to provide safety advice to [the] marketplace to protect consumers." Other companies that have recalled medical devices this year include (in order from most recent): Physio-Control, ICU Medical, Medtronic (two separate recalls), Edwards Lifesciences, Smiths Medical, West Pharmaceutical Services, Terrific Care/Medex Supply, Draeger Medical. For details about 2019 medical device recalls, click here. For 2018 recalls, click here. For 2017 recalls, click here. And for 2016 recalls, click here.